Smart Contracts & Blockchain. Because, want it or not, the future (already) belongs to them. The development and planning associated with Blockchain has started an open and intense debate in almost all of the professional verticals. Directly or indirectly, everyone in the industry has heard about it. But, what is actually changing and how can you benefit from adopting Blockchain solutions? And, in particular, what scenarios are at stake at the Smart Contracts level? When it all started to revolve around the concept of Smart Contracts, the first thought was to consider them a threat to some professions, e.g., lawyers and notaries. But, Blockchain – or, more precise, Blockchain’s use as Smart Contracts – is not destined to jeopardize such professions: that would be a very inaccurate simplification, to say the least! Sure, like all transformations, it will require a change and certainly lots of professionals will be asked to review their role and approach in the creation of highly innovative contractual forms. However, in order to fully appreciate what kind of change Smart Contracts are bringing about and which sectors that will be more impacted, it is first important to understand what this is all about. So let’s dig a bit deeper into the matter without any claim of completeness. First off, Smart Contracts are in no way a brand new topic. In fact, the term has been actively dealt with since the 1990s, regardless of Blockchain. Sure enough, Blockchain’s disruption has the undeniable merit of having introduced the necessary “Trust, Reliability and Security” attributes that Smart Contracts needed to be credible and that in the past were being necessarily delegated to third parties. But, all in all, the idea itself brings us all the way back to the 70’s, when the need was pretty simple and related to finding some effective way to manage the activation or deactivation of a software license based on very simple conditions. Either way, a Smart Contract is the translation in “code language” of a contract, aiming at automatically verifying the occurrence of certain conditions and to automatically execute actions when the determined conditions between the parties are reached and verified. 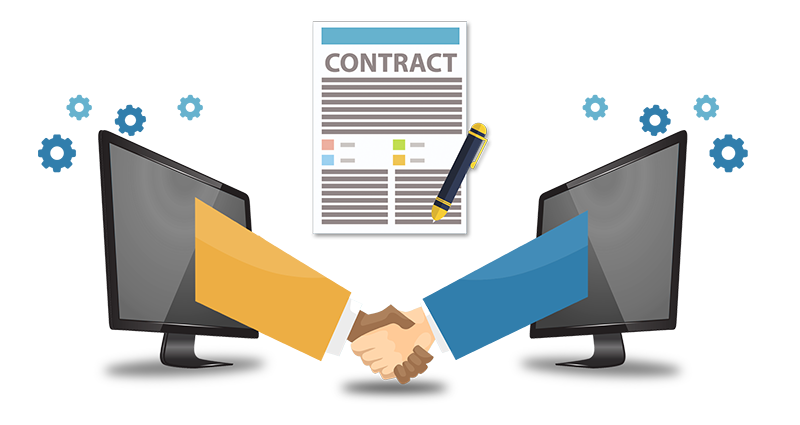 In other words, the Smart Contract is based on a code that parses both the terms that have been agreed upon and the operational conditions in which the agreed conditions must be met, and which automatically commits as soon as it determines that the actual situation corresponds to the data referring to the terms and conditions which have been agreed upon. From this perspective, Blockchain is the key underlying platform, with the role to support and enforce all that by granting the aforementioned necessary levels of trust, reliability and security. In a nutshell, Blockchain guarantees that everything takes place in a consistent way and that, even in the absence of human intervention and the weight of its interpretative contribution, Smart Contracts are based on extremely precise descriptions for all circumstances where all conditions and situations are considered. The most important aspect of all that, is that the Smart Contracts will be able to take place in a completely decentralised way. This means that every participant to a given blockchain channel will be able to directly deal with other parties (customers, partners, suppliers, etc.) with no more middle men, thus reducing costs through totally reliable and trusted network of peer participants. One relevant corollary in such a big paradigm shift is that the theme of “trust” is moving out of the law firm to the developer’s territory. So, having said that, what can be expected now? Whilst it’s not easy to provide an accurate enough answer that takes into account all possible contour conditions, we can try and make some general assumptions around a future where we’ll have a computer system that allows us to create distributed, transparent, and totally unalterable public registers to record any transaction without the need for third-party trusted parties. And, become more capable of managing the execution of automated instructions (the Smart Contracts, indeed). One thing is for sure: here at 24 Solutions we have accepted the challenges that such a disruption will bring and we are now actively working towards, very soon, being able to cover all of the above items. Can tokenization reduce audit scope?